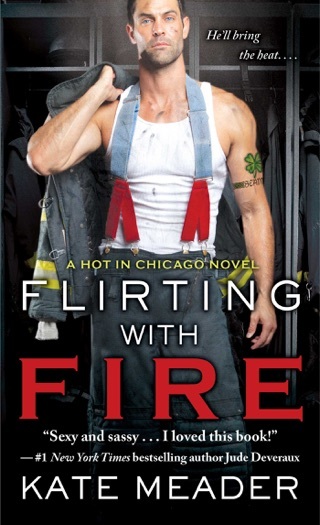 This is the first book in the Chicago Rebels series by Kate Meader. It is the first book I have read by this author and I thoroughly enjoyed it. It has an engaging storyline, entertaining characters and I can't wait to read the next story in this series. This is a charming and emotional story about three estranged stepsisters forced together by the dictates of their father's will. Their father was a critical man and now even in death, he has made their lives difficult. This is Harper's story. Harper is disappointed her father didn't leave the Chicago Rebels hockey team to her. Now she has to deal with two stepsisters she barely knows and they have to make all the decisions about the team together. Harper has been working for her father and with the team for years and she is now the acting general manager. Remy and Harper are brought together when Harper acquires Remy for the Chicago Rebels. Remy’s nickname is Jinx because he is considered the unluckiest guy in the NHL and he is not happy when he is traded to the Rebels. I really liked Remy. He has a great Cajun accent, is close to his family, loves to cook and is sensitive, caring and protective. When Harper first meets Remy she doesn't have a very high opinion of him but the more she gets to know him, the more she likes him. Harper and Remy have a lot of chemistry but because she is his boss, they fight their attraction. My only issue with this story, is there were times I had a difficult time liking Harper. Her father was a mean and heartless man and left all his daughters with issues. Harper can be cold and distant and doesn't always treat Remy well. Remy is always so patient and understanding with Harper and while I admire his patience, I didn't think she deserved it. I liked Harper’s two stepsisters and can't wait to read their stories in the upcoming books in this series. This is a fun and heartwarming story. I love a good hockey romance and Irresistable You is a great start to this hockey series. Harper is such a strong heroine who has had a crappy father and mother and not much family to speak of. Remy is the total opposite. He knows what it's like to have the love and support of a great family and wants nothing more than to be Harper's person. They start of as enemies, but quickly find that there is so much heat beneath the fiery looks and heated words. Harper and Remy were hot and I loved how Remy truly did what he needed to do to become Harper's person. Sometimes what you think you want isn't always the grand prize when you get there. Great story! I really enjoyed it. Kate Meader never fails to deliver for me. I love a hockey book and to be honest I was worried that I wouldn’t love it as much as I love her firefighter book because I have read a TON of hockey books. I should feel silly to have ever even had such a thought. Irresistible You was amazing. Harper and Remy were more than I could have imagined. Remy was to die for, with his bulking frame, tough demeanor and penchant for breaking out his French at just the right moment, the Cajun hockey player hit all my buttons just right. For her part Harper was equally tough but soft when needed. Being boss and employee put them in a tough spot and watching them tread the waters of a fling when both knew it was a bad choice was hot and intense. If you a hockey fan than this is a book you don’t want to miss. These two have an undeniable chemistry and the circumstances forcing them to keep secret only made everything more exciting. I am a long time Kate Meader fan and this is just one more in a string of amazing books from her. Grab it today!